I only heard about the Korova cookie last week from the sweet and fabulous Anita of Dessert First. Anita’s title was “My Favorite Cookie Ever”. If you have ever read Anita’s blog, you’ll know that she is serious about pastry; so, when she said it was her favourite, I knew I needed to make them. I recommend reading Anita’s post as it is crafted with genuine excitement, knowledge and passion – plus, she has the recipe written with wonderfully detailed directions. The original recipe can be found in Dorie Greenspan’s book Paris Sweets. 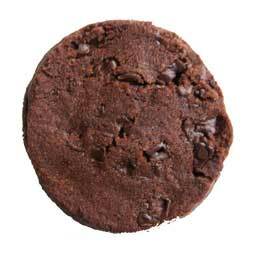 The Korova cookie, which is also known as the World Peace Cookie, is the creation of famed French pastry chef Pierre Herme. The cookie was delicious, and best of all it was simple to make. It has a well-balanced flavour and texture. The flavour is intense and rich with chocolate; the sweetness is counterbalanced by fleur de sel. The texture is dense, crumbly, moist and melt-in-your-mouth good. This recipe is a keeper. Once again, I would like to thank Anita, Dorie and Pierre. Posted by Sam at 10:34 p.m. Okay, now I have to make them. Looks delicious, Sam! Paris Sweets is on my wish list! I failed at my last attempt at Pierre Herme goodness (chocolate macarons) but this looks much more doable, they're going on the "to-make" list. Glad you tried them out and liked them! Thanks for helping me spread the word about this cookie! Peabody - You do have to make them! Gilly - It also on my wish list now too. Somehow I think we will both be purchasing it soon. Lis - I hope you do make them, I don't think you will be dissappointed. Brilynn - They are incredibly simple. Anita - Thank-you again for introducting me to this cookie. I am always on the look out for wonderful cookie recipes.